First of all, I must admit I haven’t made or posted a vegan cheesecake recipe for ages. 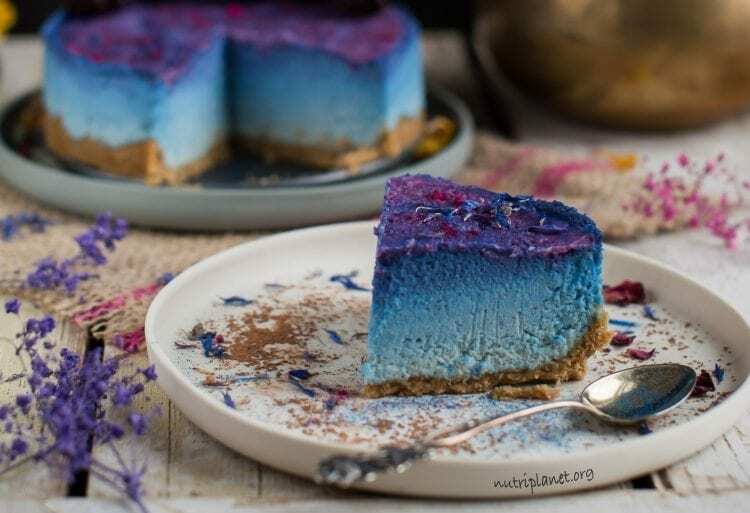 So, it was about time to prepare a raw cheesecake again! 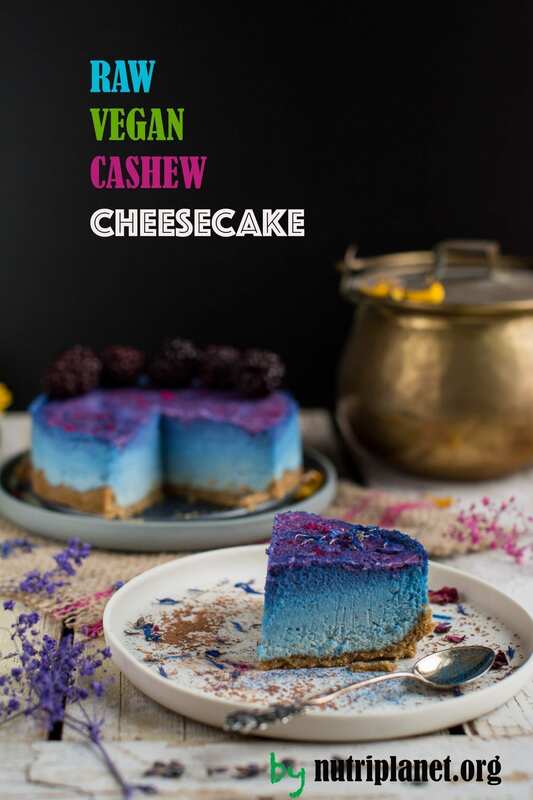 Now, I don’t know about you, but I think of cashew cheesecake as one of the ultimate vegan desserts to indulge in from time to time. The reason is behind the cake’s creaminess and above all, its fat content. Keep on reading to discover how much of it is healthy to eat! Given the fact that I didn’t follow any recipes, my vegan cheesecake turned out great! I even dare to say it’s the best I’ve ever made. 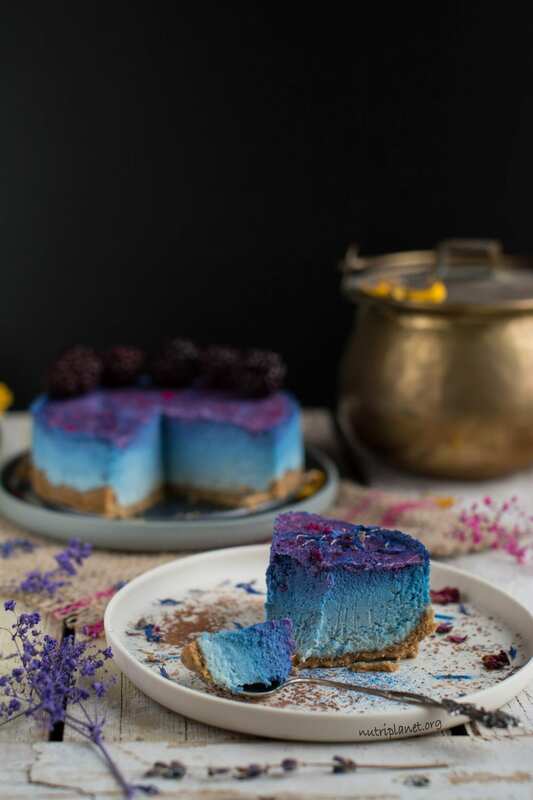 The last time I prepared a raw vegan cheesecake was in October 2016, when I was on Candida cleanse diet, i.e. no cashews were allowed. So, back then I experimented with Cauliflower and Tahini Cheesecake. Luckily, that is water under the bridge and I can have those divine cashews again! Not that there was anything wrong with the other cake, but because in my opinion, nothing beats cashews when it comes to a raw cake. You just gotta love those nuts for their creaminess and sweetness! Now, let’s start from the beginning! While regular cheesecake is made of dairy cream cheese and lots of sugar, my vegan version includes soaked cashew nuts and coconut manna for the creaminess, xylitol for sweetness and finally oats for texture. 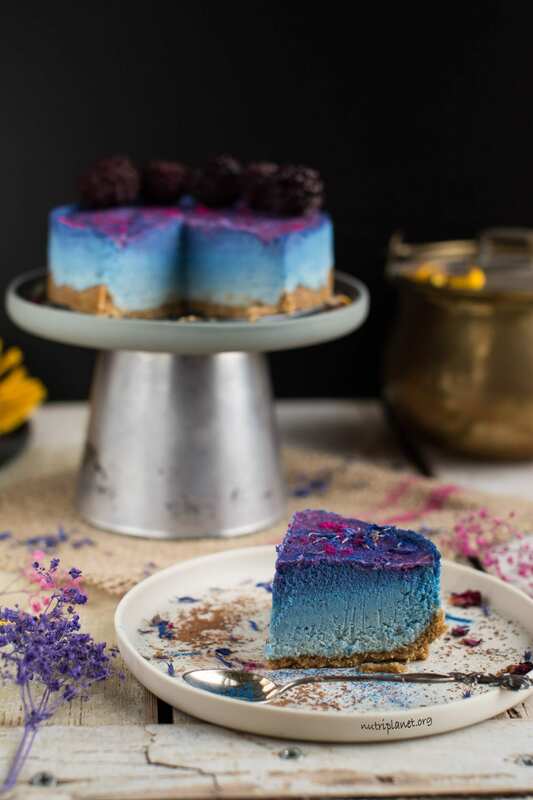 By the way, has anyone seen oats in a raw vegan cheesecake recipe before? Well, I haven’t! Maybe I just need to look harder… Anyway, it just so happened that I needed more volume and thickness to my cheesecake. Funnily enough, my thought somehow turned to gluten free jumbo oats. I always have them in my pantry, because they are so versatile and scrumptious! Fortunately the oats totally hit the spot in this vegan cheesecake recipe keeping its texture so stable and homogeneous. Furthermore, there is another ingredient I only recently discovered, i.e. coconut manna or puree. The coconut flavor from this heavenly food is divine! I favour it especially for being a whole food, which is pureed coconut. It is food as nature has packaged it, nothing removed and nothing added. Moving on, I made only a tiny cake because despite using only whole food ingredients, this vegan cheesecake is very high in fat. Therefore, I’m not looking to eat a lot of it at one go. Saying that, I find it sufficient to use 11 cm (4 inch) cake tin. However, you can make it in any of the springform pans you find suitable by doubling or tripling the recipe. Finally, I’d so much appreciate your feedback below in comments or by tagging me in social media when you post a picture of your own creation! First, soak cashews for at least 2 hours, then rinse and drain. For the crust, process walnuts with a bit of Himalayan salt in food processor until fine crumbs. Then add the remaining crust ingredients and process until you have homogeneous batter that sticks together when squeezed between fingers. Press the crust batter into a small 11 cm (4 inch) springform cake pan and put into freezer until you make the filling. Next, for the filling, soak rolled oats in almond milk for about 10 minutes before adding them to the other filling ingredients. Alternatively, grind your oats into flour or use oat flour instead. Then, process soaked cashews with all the other filling ingredients in a blender or use immersion blender. Now, pour the filling onto the crust and spread it out evenly. Finally, put the cake into freezer for 4-6 hours. 2. Next, stir in a bit of chosen powder and transfer a thin layer onto the crust. 3. Then, add a bit more powder, so that the colour turns a bit darker/more intense. Transfer another thin layer into the cake tin onto the previous layer. 4. Continue until your batter runs out. I used blue spirulina powder first and added some butterfly pea powder at the end. To create the galaxy effect I melted some coconut manna and coloured it with pink pitaya powder. 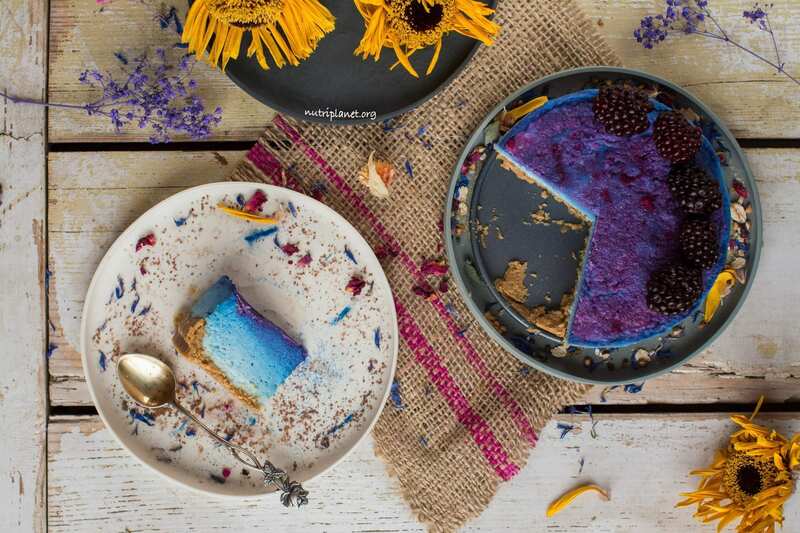 After that I drizzled the pink manna on top of the cake and spread it out with a spoon, so that the pink got blended with the blue. Nutritional info (⅛ of the cake): 204 kcal, 12.3g carbohydrates (24.2% of kcal), 15.2g fats (67.4% of kcal), 5.78g protein (11.4% of kcal), 2.07g fibre, and 5.1 GL points. P.S. I included 10 grams of coconut manna for the top swirl into the calculation above. NB! 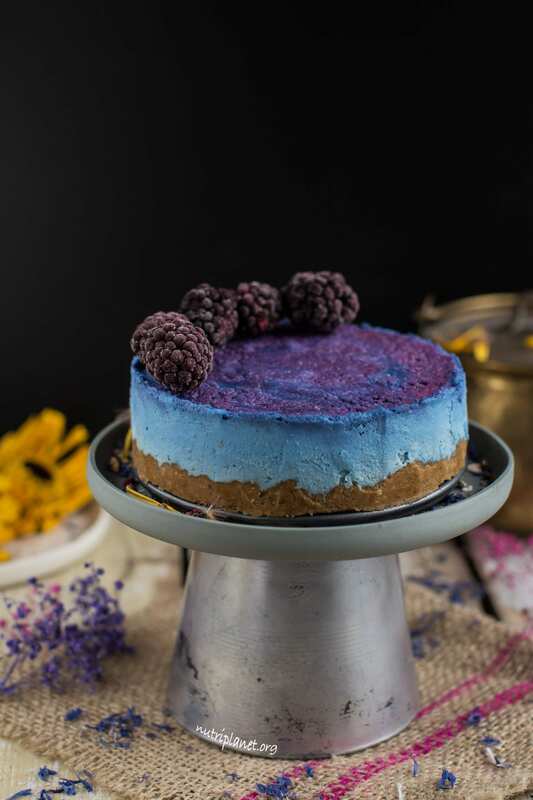 Now, if you want to keep your daily fat intake in healthy range, only have a tablespoon of flax or chia seeds and about 10 grams of other nuts/seeds on a day you eat a piece of this wonderful vegan cheesecake. Make a double (triple etc.) batch for bigger cake. You can use any nut butter instead of peanut butter in the crust. Also, feel free to use any other nuts other than walnuts. Coconut nectar can be substituted with xylitol, agave or maple syrup. 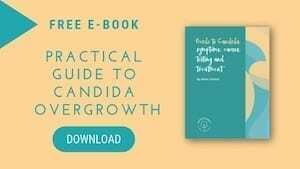 If you’re not on Candida diet and don’t have trouble with blood sugar fluctuations, feel free to substitute xylitol with any sweetener of choice, i.e. raw cane sugar, date paste, maple syrup, agave syrup etc. Should you not have almond milk, use any plant milk instead. Hi, i love the look of the cheesecake but in nZ there is no such thing as GF Oats. Could you please suggest an alternative. TY. If you don’t have issues with gluten, you can use regular oats. Alternatively, replace rolled oats with buckwheat flakes in crust and use raw buckwheat flour in filling. Maybe put about 5 grams less as buckwheat soaks more liquid. I found these on amazon.com.au https://www.amazon.com.au/Quaker-Oats-Gluten-Wholegrain-Rolled/dp/B072BJYRMJ/ref=sr_1_3?ie=UTF8&qid=1543569828&sr=8-3&keywords=gluten+free+oats You can grind them into flour. Yes, it’s individual — if you don’t tolerate avenin in oats, you can’t have them!